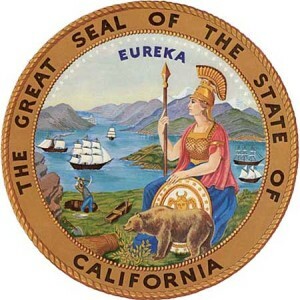 AB 1795, however, would prevent the court clerk from allowing access to information about Ellis Act evictions, regardless of whether the landlord prevails in 60 days. Ellis Act evictions often feature a fight about wealth; the tenant has a non-transferable, valuable property interest in their rent-controlled tenancy, while the landlord wants possession of her valuable asset. In San Francisco, for instance, the City actively encourages tenants to hold over and fight Ellis Act evictions. (After all, there’s no better affordable housing than the exiting unit that already has a rent-controlled tenant in it.) But it is difficult to read this amendment as anything other than tacit encouragement from Sacramento for tenants to violate the law and fight an eviction with fewer consequences. A landlord would understandably be interested in knowing that her prospective tenant is likely to violate obligations other than paying rent, as well. How Long Does an Ellis Act Eviction Take? The short answer is that it takes 120 days to terminate a tenancy, unless the tenant is at least 62 years old or is “disabled” (as defined by the Ellis Act and housing discrimination law), in which case, it takes a year. Of course, this just answers the question of how much notice your tenant receives before their tenancy is terminated. In San Francisco, the Ellis Act has become more of a political issue than a legal one. (Ellis-displaced tenants receive priority affordable housing, and they have received city-funded legal defense long before the passing of Proposition F.) More often than not, tenants hold over after their tenancies are terminated, aiming to defeat the eviction lawsuit and preserve their tenancy. Sometimes they are successful. Even when the landlord is successful, they should expect to add five months of intense litigation to their timeline to recover possession. Preparing for an Ellis Act eviction may require a review of the history of the tenancy (including changes in occupancy), clarification of the form of record ownership, changes in insurance coverage, and even refinancing, if the lender won’t allow Ellis evictions. In other words, the best time to start this process was yesterday. The second best time is right now. 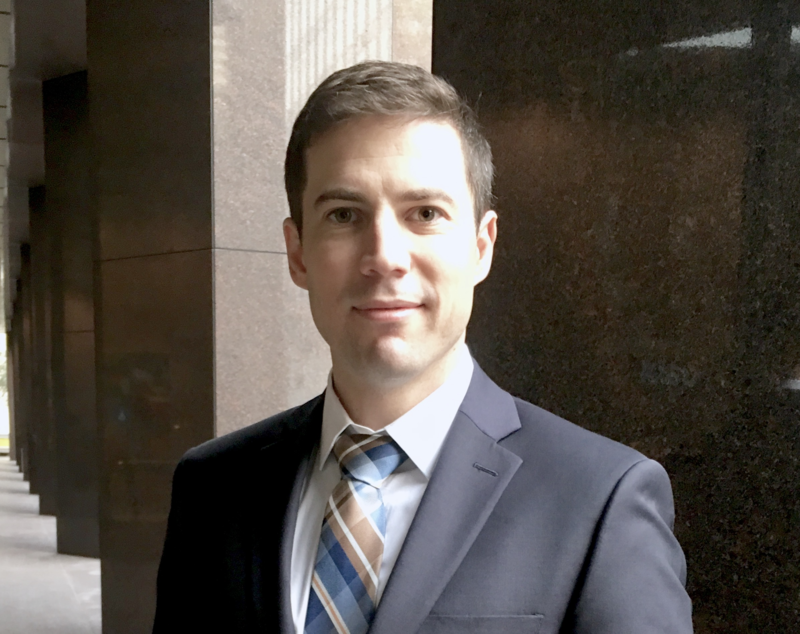 Will a “Protected Tenant” Prevent Me from Using the Ellis Act in San Francisco? No, it will only delay your efforts by about eight months. The concept of a “protected tenant” has nothing to do with the Ellis Act. The term comes from one of San Francisco’s other just causes for eviction – the “owner/relative move-in eviction”. Cities may regulate the substantive grounds for eviction of residential tenants, but for constitutional reasons, they must allow at least some mechanism for an owner to live in their own home (or else the tenant’s permanent physical occupation is a “taking” in violation of the Fifth Amendment). The Ellis Act, on the other hand, is the only substantive ground for eviction regulated at the state level, and it provides landlords the “unfettered right” to go out of business. Tenants who are at least 62 or are disabled and who have lived in their rental units for at least a year may make a one time claim of extension of the termination date of their tenancy (from 120 days to a full year from the initial filling of paperwork). While there are no absolute defenses to the Ellis Act, the road to going out of business remains perilous. Especially where it may take a full year to test your paperwork, there is no substitute for qualified counsel. Ordinance 286-13, however, allowed such modifications within the existing building envelop, so long as residential use was principally permitted in the zoning district and the owner had not performed a non-fault eviction at the property. The owner could not make any changes for a period of ten years following a non-fault eviction. 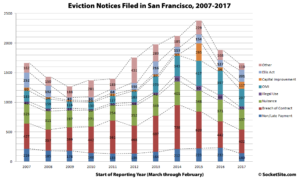 SocketSite.com reports the ten-year trend of eviction notices filed with the San Francisco Rent Board. The trend for 2017 is a decrease across the board, with one exception – the Ellis Act. SocketSite doesn’t express an opinion on the cause for the trend (at least until you get to the comment’s section). However, a recent decline in breach/nuisance evictions may be attributable to the 2015 Jane Kim Amendment (which heightened both the pleading standard and the substantive threshold for a landlord to prevail here). The recent decline in OMI/RMI evictions may be because of the uncertainty of the “educator” amendment or the more stringent enforcement of fraudulent owner move-in evictions. Ellis Act evictions may be up in recent years (compared to 2013) following a dip during the uncertainty created by the “Campos I” and “Campos II” enhanced relocation assistance payment legislation.